The iRig PowerBridge from IK Multimedia is a continuous charging system for Lightning devices, such as an iPhone, iPad, or iPod touch and digital iRig accessories. 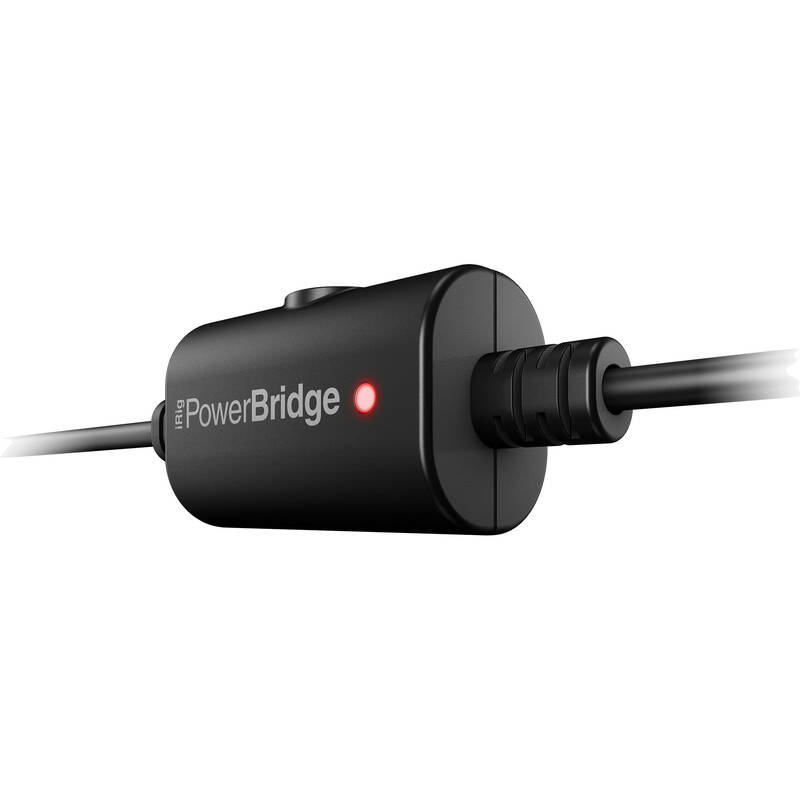 The PowerBridge features an ultra low-noise audiophile-grade power conditioner with a power outlet connection on one end and a Lightning connector on the other. Between both ends is a female Mini-DIN connector that connects to any iRig device with a Mini-DIN or Micro-USB port. The system not only powers your iOS and iRig devices, but also passes along audio and MIDI information. The PowerBridge ships with a power cable, a Mini-DIN to Mini-DIN cable, and a Mini-DIN to Micro-USB cable. Box Dimensions (LxWxH) 9.7 x 5.3 x 2.6"
iRig PowerBridge with Lightning Connector is rated 4.8 out of 5 by 4. Rated 4 out of 5 by MrMoonscooter from Power Bridge does what it Says !!! I ordered this product because I do a lot of Live streaming of Audio. I use the IrigHD Mic and noticed i was draining power rather quickly. I purchased the Powerbridge and was skeptical that it would create some sort of hum on audio, but i was wrong, not only is the sound excellent but i dont have to worry about charging at set break !!!! Rated 5 out of 5 by Scott from The iRig PowerBridge works perfectly!!! It keeps your iPad fully charged while you are using it to play through. Great design, small footprint, does not heat up, and it comes with all the cables you might need to connect it to your iPad, all the way back to the 30 pin. configuration, as well. It works exactly as it is intended, and is absolutely worth every penny!!!!! Rated 5 out of 5 by Deanna from Could not have used my iRig Pro DUO without this. We do lengthy live stream video so we need to provide power to our iPad when using our iRig Pro DUO to bring in our condenser mics. Since the iRig Pro DUO uses the lightning connector to send the sound to the iPad, this is your best bet for adding power to the iPad as well. Rated 5 out of 5 by James from Works Great I got tired of waiting for my phone to charge so that I could record with my Irig HD, so I bought the power bridge and it's made recording on my iPhone a lot easier. How man pins does the mini din cable have? 7 pins with a center locking stud. I noticed this has micro USB for I rig devices. Are those I rig devices with micro USB ports the kind which would also plug into an android device or pc? basically I'm looking to run a class compliant USB sound card other than Irig devices (which other card by itself runs on the iPhone) , while charging an iPhone. The iRig PowerBridge will be able to work with iRig units with Micro-USB ports that can also connect to Mac/PC (iRig HD 2 for example). Do note however, at this time, the iRig PowerBridge is only designed for use with iRig products. Unfortunately, third party devices will not work with this unit.